The United States Marshals Service has awarded Armor Express, Inc., a leading manufacturer and distributor of high-performance body armor solutions, a contract to outfit officers in the Western District of Virginia with the Busch AMP-1 TP ballistic helmet, which is certified to the VPAM standard. Introduced in early 2017, the Busch Protective AMP-1 TP helmet is certified to VPAM (HVN-2009), the gold standard of ballistic testing within Germany, Austria and Switzerland. 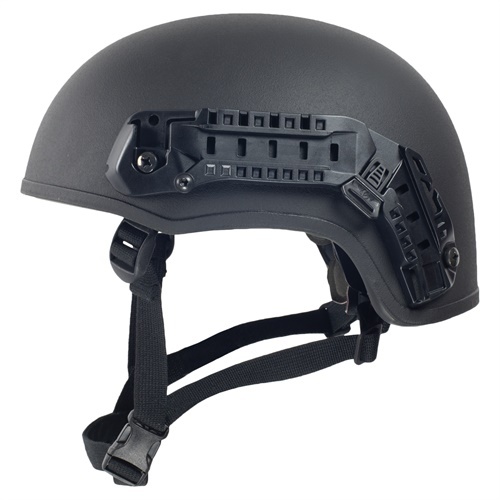 The helmet is constructed of a multi-layered aramid composite, using a patented EBSP method–a production technique that creates elite ballistic capabilities previously attainable only in titanium helmets, according to Armor Express. Weighing an average of 3.6 pounds, the AMP-1 TP can stop ballistic threats as close as .78 inches from the edge and multiple shots on a small surface area. The company says its increased edge and multi-impact capabilities enhance the helmet’s protective area by up to 50%, compared to standard ballistic helmets. For the risk of taking multiple hits at close range, another key protective element is the helmet’s ability to transfer and dissipate energy around its shell, thereby reducing blunt force trauma. According to Armor Express, the helmet’s EBSP process counters this threat, thereby significantly reducing the energy transfer to the skull to less than 25 joules. VPAM’s extremely high testing requirements measure back-face deformation, ensuring when the helmet is hit by an incoming round, there is minimal energy transferred from the helmet shell to the user’s head. Further, the AMP-1 TP offers high fragmentation protection of more than 2,034 f/s, according to STANAG 2920. The helmet comes with a rail-system with speed-connect system (SCS) technology, advanced protective padding system certified to the EN 397 (impact/shock attenuation standard), wheel dial for uni-sizing flexibility, and protective bag. Armor Express says the "uni-size" feature helps departments with limited budgets to eliminate the cost of having to purchase multiple units based on individual fit. The special rail-system with speed-connect system (SCS) gives the wearer more tactical and modular protective capability. Modular protective visors with varied protection levels—including blunt impact, fragmentation, or 9mm/44Mag—can be added or removed from the helmet within seconds, without ever having to take off the helmet. Additional accessories include the NVG 3-hole shroud, helmet cover (black or green color), helmet Velcro kit, helmet counter weight kit, visor protective cover and side-rail adaptor. The AMP-1 TP helmet comes in black, green, and sand colors. For more information, visit www.armorexpress.com. Armor Express is a leading manufacturer and distributor of high-performance body armor systems. Founded in 2005, the company has grown to become one of the largest providers of soft and hard armor products and accessories, serving law enforcement, the U.S. military and America’s allies around the world.